squire: Today I want to talk about three “Themes” that run through this entire chapter, in the background. But no matter how many questions I come up with, there are many others that I’ve passed over for lack of space. Please feel free to comment on any aspects of these texts and themes that interest you. “The War of the Ring” is one of the subtitles of LotR in Frodo’s history. Since the previous June, we know, Gondor and Mordor have been openly at war. We heard rumors of this back in the Shire, and confirmation from Boromir at the Council of Elrond. We readers have since seen much of another war, between Rohan and Isengard. But only now do our hobbit heroes finally get caught up in one small skirmish in this great war, fought in the borderland of Ithilien. I want to consider here what we can learn about this War, and about Tolkien’s approach to writing about war. Suddenly he halted and listened. Had he heard a whistle or not? Or was it the call of some strange bird? If it was a whistle, it did not come from Frodo's direction. There it went again from another place! 'Did you hear a whistle, and what sounded like an answer? ' he asked. `A few minutes back. I hope it was only a bird, but it didn't sound quite like that: more like somebody mimicking a bird-call, I thought. squire: A. This is not the first time Tolkien has used the old “bird call” trick. Outside of movies and pulp adventure fiction, who does this, really? dernwyn: No bird, that Whistle-languages actually exist. The untrained ear hears only whistles and calls; but the "speakers" can pass along information in full sentences this way, acoss long distances. I would assume that, given the nature of what Sam hears, Faramir and his men have been trained in the use of at least a basic whistle-language which "camouflages" itself by mimicking local bird-calls. Four tall Men stood there. Two had spears in their hands with broad bright heads. Two had great bows, almost of their own height, and great quivers of long green-feathered arrows. All had swords at their sides, and were clad in green and brown of varied hues, as if the better to walk unseen in the glades of Ithilien. Green gauntlets covered their hands, and their faces were hooded and masked with green, except for their eyes, which were very keen and bright. At once Frodo thought of Boromir, for these Men were like him in stature and bearing, and in their manner of speech. squire: B. Any mention of cloaks, as certain dim-ish illustrators would have them? Was camouflage an accepted device in legendary or medieval times – or in World War I? With his keen hobbit-eyes he saw that many more Men were about. He could see them stealing up the slopes, singly or in long files, keeping always to the shade of grove or thicket, or crawling, hardly visible in their brown and green raiment, through grass and brake. All were hooded and masked, and had gauntlets on their hands, and were armed like Faramir and his companions. Before long they had all passed and vanished. squire: C. What is the command structure of this very dispersed Ranger force? How many are there in this attack, do you guess? Is this a larger than usual operation for Faramir? 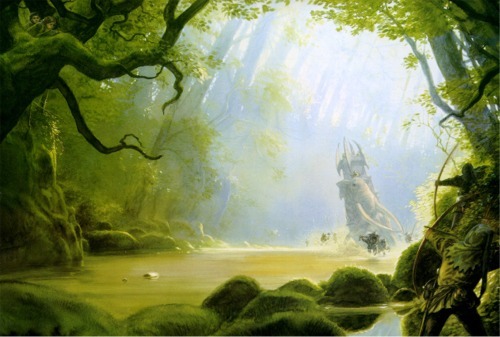 squire: D. We’ve seen it time and again in The Silmarillion; we’ve seen it in the Wild around Bree; now we see it here. Why is Tolkien so interested in guerilla/ranger/bandit forces? squire: E. Why can Gondor no longer control or dominate the Harad kingdoms? PhantomS: holy phaunts They lost the best part of their navy to Castamir's rebellion, and their navy was arguably the strongest part of their military. Cavalry is an important part in maintaining an empire for movement of forces, and Gondor is now dependent on the Rohirrim for that. So Gondor's army has lost its mobility and its strength in technology. It doesn't help that Sauron runs the roads past Morgul and down to Poros; even when Gondor ruled there, any Harad force would have Mordor to count on for help. squire: F. “I doubt not the walls of Minas Tirith are doomed.” What kind of attitude does Damrod have about this war? What makes him fight? F. “I doubt not the walls of Minas Tirith are doomed.” What kind of attitude does Damrod have about this war? What makes him fight? PhantomS: I've said that Denethor instills some nationalist feeling in his Rangers; but the Gondorians are like the Elves, fighting a long defeat over a long time. None of the cities of Beleriand survived, but they all put forth a good fight and important contributions. Minas Tirith is but the next one. Mablung mirrors this in the passage below. squire: G. Why do the Gondorians attempt an ambush at high noon? How big is a regiment? Wouldn’t a surprise attack on the Haradrim’s camp at night be more effective? How does this scene contrast with Aragorn’s expedition through here two weeks later? PhantomS: Aragorn had an army at his back and beside him and a great deal of the Haradrim cavalry were killed at the Pelennor-the very units that could make life difficult. they have pretty good archers too. At high noon, the Haradrim are waddling through the forest like ramblers, at ease-they are Men, after all and not Orcs- so if one bit gets attacked those far behind might not get the alert and when they do catch up all their comrades are dead or wounded. a man fell, crashing through the slender trees, nearly on top of them. He came to rest in the fern a few feet away, face downward, green arrow-feathers sticking from his neck below a golden collar. His scarlet robes were tattered, his corslet of overlapping brazen plates was rent and hewn, his black plaits of hair braided with gold were drenched with blood. His brown hand still clutched the hilt of a broken sword. PhantomS: THis certainly rings 'Caribbean' or Carthage'. And it is indeed these Swertings, though Harad is composed of so many peoples Gollum might have seen some other tribe. And who's to say the Rohirrim don't have golden braids and collars? Or the Elves with silver? I'm still upset that the movie switched the Easterlings and Southrons. He woke, thinking that he had heard horns blowing. He sat up. It was now high noon. The guards stood alert and tense in the shadow of the trees. Suddenly the horns rang out louder and beyond mistake from above, over the top of the slope. Sam thought that he heard cries and wild shouting also, but the sound was faint, as if it came out of some distant cave. Then presently the noise of fighting broke out near at hand, just above their hiding-place. He could hear plainly the ringing grate of steel on steel, the clang of sword on iron cap, the dull beat of blade on shield; men were yelling and screaming, and one clear loud voice was calling Gondor! Gondor! squire: I. Why do the horns blow? What part do horns play in Tolkien’s story as a whole? Will we ever hear the sounds of battle so vividly again in the story? How and when does Tolkien use sound as part of his descriptive palette? PhantomS: Just to scare people and tell the other units to move in a coodrinated fashion. I think they work better for cavalry,though. For a moment he caught a glimpse of swarthy men in red running down the slope some way off with green-clad warriors leaping after them, hewing them down as they fled. Arrows were thick in the air. squire: J. The Haradrim have armor and shields and march in formation, according to the text. Why are they defeated by the lightly dressed Rangers once the Gondorians close for hand-to-hand combat? PhantomS: They don't know that they in fact have the advantage, and the forest makes formations into little pockets, which the Rangers can pick off quickly. The Haradrim expect armoured Gondorian troops, not to be shot off their elephants by..birds? Sam and Frodo see only this bit. The other Haradrim are probably confused, or forming up. When the march stops and they fortify, the Harad will have the upper hand. Faramir is making sure the confused faction remains the larger. He came to rest in the fern a few feet away, face downward, green arrow-feathers sticking from his neck below a golden collar. squire: Ah, the cinematic beauty of death by arrow-shot! (bravo, Sean) Ah, the cinematic impossibility of showing a dead man that has been hacked into pieces by a broadsword! K. How does Tolkien balance the gruesome reality of sword combat with the romance of his story? Are his battle scenes believable? PhantomS: A bit on the hyperbolic side, but hey, this is a battle for the world! squire: L. What does ‘evil of heart’ mean in this context? nefisa3: whew...i'll just tackle one point... that is, I believe (L) about Sam's thoughts on the dead Man, and "evil of heart". I love that it is Sam who thinks this, because i think Sam sees himself in this fallen soldier, more than any of the others around would have. The dead Man is just a pawn of the war, and Sam wonders then if he was like himself; humble, concerned with his own family and things; not a great traveller. The Man is not a ring-bearer or a captain or a wizard or a king. He's just this guy, you know? Which is all Sam is. I think this is why seeing this death shakes him up so much. This is what happens to simple folks in war. Death. So Sam senses the similarities in their situation in a way, and thus questions the evil of heart, since he is not evil of heart. also, it's one of the few times that, even through projection onto someone else, we get a sense of Sam's fear and sadness about being on this whole Quest and in the middle of a war. Merryk: There it is. I was fishing, in an earlier post, around for some reason why we hear Sam's thoughts on the fallen and not Frodo's (or Faramir's *roll eyes quietly in nitpicker's sympathy.) Sam has the authority to speak because he and the dead man are equals. Nicely said. Farawyn: Yes, I do know, now. He's the reluctant soldier as well. Very good, nefisa! PhantomS: Is he Orcish? Is he like the Balrog of Moria? Is he like Sauron? All the men Sam has met have been good hearted, even proud/arrogant ones like Boromir or the dim but farthinking Barliman and Farmer Maggott. Seeing a Haradrim man for the first time, he stops to think - are Big People all the same? Merry and Pippin have the benefit of meeting the Rohirrim and Saruman, as well as the Ents, learning quickly and growing up. Sam has spent his time with Frodo, Faramir, the Rangers, and Gollum. So he is still naive to some things, and that is his charm. I love this passage because Sam recognizes that not all that go to war necessarily want to be there. There is a reluctant soldier. Is his heart with Sauron, or is he and 18 year old kid who came to war for different reasons? No matter, he's dead just the same. How Sam comes to this, I do not know. Just another flash of his mind at work. squire: M. Will the Rangers carry away their dead? Will the Haradrim or other forces of Mordor bury this man and his other fallen companions? PhantomS: They might, unless they cremate. The Rangers might gather their dead in one spot and recover their men later after the field is stable. Judging by their skill, I wouldn't bet on too many of them dying. Farawyn: This harkens back to what Sam is saying, and I guess it has to do with how evil of heart they really are. It touches on the complexities of war in way that Tolkien often does not- little shading of gray in the good guy bad guy style; Do they bury their dead? Do they respect the fallen? Do they mourn? It leads to- do they love, and if they do, can they still be evil of heart? For just as Mablung stepped towards the fallen body, there was a new noise. Great crying and shouting. Amidst it Sam heard a shrill bellowing or trumpeting. And then a great thudding and bumping, like huge rams dinning on the ground. Big as a house, much bigger than a house, it looked to him, a grey-clad moving hill. Fear and wonder, maybe, enlarged him in the hobbit's eyes, but the Mûmak of Harad was indeed a beast of vast bulk, and the like of him does not walk now in Middle-earth; his kin that live still in latter days are but memories of his girth and majesty. On he came, straight towards the watchers, and then swerved aside in the nick of time, passing only a few yards away, rocking the ground beneath their feet: his great legs like trees, enormous sail-like ears spread out, long snout upraised like a huge serpent about to strike, his small red eyes raging. His upturned hornlike tusks were bound with bands of gold and dripped with blood. His trappings of scarlet and gold flapped about him in wild tatters. The ruins of what seemed a very war-tower lay upon his heaving back, smashed in his furious passage through the woods; and high upon his neck still desperately clung a tiny figure-the body of a mighty warrior, a giant among the Swertings. O. 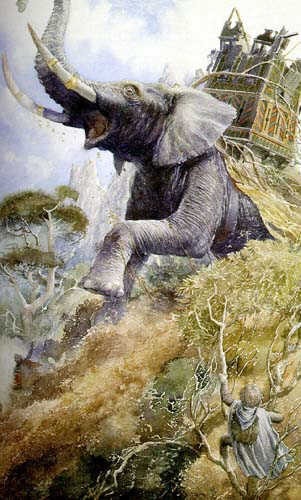 Why is Tolkien’s mumak so much larger than a modern-day African elephant, such as Hannibal used against Rome or Alexander used to build his empire? drogo_drogo: Elephants on steroids The larger mumakil fit in with the familiar-yet-fantastical nature of Middle-earth versus our modern world. 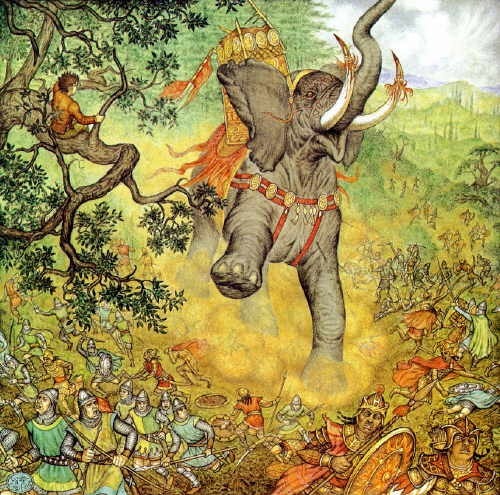 Tolkien wanted to evoke the legendary battles of Alexander and Hannibal's attacks on Rome, but step it up a notch by making these more elephantine than elephants, so to speak. Just as wargs are wolves on steroids, so too are these beasts exaggerated, "primordial" versions of what could become the smaller African or Asian elephants. 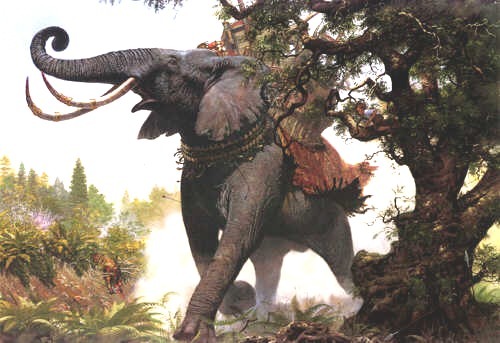 Anchises’ Ghost: Just as a random bit of info . . . . . . the 'African' elephant used by Hannibal is actually thought to have been a now-extinct species of forest elephant that was actually smaller than a modern Indian. So not only are the mumakil bigger than modern elephants, they were a LOT bigger than the most famous military elephants in history! Needless to say their main use was in scaring cavalry, rather than as the huge battering rams of the movie. Tolkien's description of them as 'castles', around which the enemy rallied because the cavalry would not go near them, is a pretty realistic usage. P. Why such detail lavished on this description? What imagery does Tolkien conjure up with his words here? drogo_drogo: This is part of exotic aspect of his novel, the part that recreates the legendary battles of past ages. Tolkien's prose becomes grander, more epic in its tone the closer they get to Gondor, so this skirmish gives us a taste of what's to come on the Pelennor Fields. PhantomS: The Greek Elephants going all wrong against the Romans comes to mind, especially with the man clinging on to the beast. On the great beast thundered, blundering in blind wrath through pool and thicket. Arrows skipped and snapped harmlessly about the triple hide of his flanks. Men of both sides fled before him, but many he overtook and crushed to the ground. Soon he was lost to view, still trumpeting and stamping far away. What became of him Sam never heard: whether he escaped to roam the wild for a time, until he perished far from his home or was trapped in some deep pit; or whether he raged on until he plunged in the Great River and was swallowed up. Thus the payoff to the funny rhyme from the previous chapter. Q. Comment on the change of tone between Sam’s recital and his actual sighting of the animal. What is the difference between an Oliphaunt and a Mumak? PhantomS: The Oliphaunt sounds like a Bilbo-ic tale, like a Were-worm. 'Mumak' sounds more like a Harad version of 'Crusher' or 'War Machine'. Maybe Tolkien left some notes that called it 'Sid'.